The Square Stand for Contactless and Chip makes it easy to connect compatible cash drawers, receipt printers, and bar code scanners. To start, be sure your Square Stand is connected to the USB hardware hub and plugged into a power outlet. Plug your Square contactless and chip reader Dock into a USB port on the hardware hub, then add a supported USB cash drawer, receipt printer, and or bar code scanner into a USB port on the hardware hub. The hardware hub is the rectangular component that connects your Square Stand to the power adapter. Learn about setting up your contactless and chip card reader. 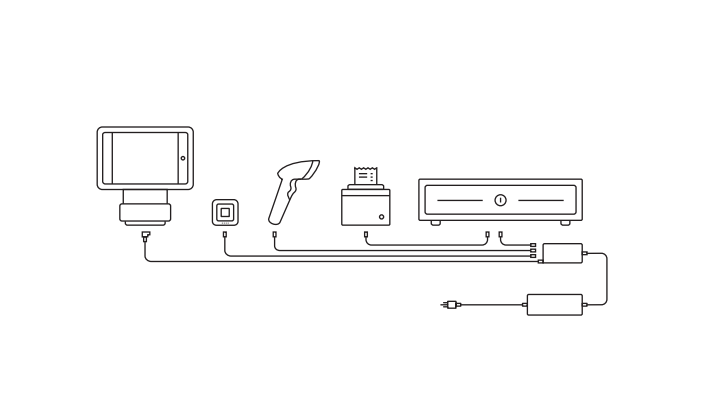 Note: Note: If you need to connect more than three hardware accessories to your Square Stand we recommend using a printer-driven cash drawer to free up space on your USB hardware hub. Your printer settings are tied to the USB port on the hardware hub where you initially connected the printer. If you unplug your receipt printer from the hub, be sure to take note of the port number for future reference. You can also connect a Bluetooth bar code scanner to the Square Stand. Note: The contactless and chip card reader can connect to the Square stand via bluetooth, or by connecting the dock to the Stand’s hardware hub. If you’re using one of the USB ports in the hardware hub to charge your contactless and chip card reader, you’ll want to make sure the cash drawer you’re using is connected through your printer. Scan the bar code labeled ** HID KEYBOARD EMULATION** from the printed Motorola Quick Start Guide while the bar code scanner is plugged into the USB hub of the Square Stand. Unplug the bar code scanner and then plug it back into the Square Stand.